How does a mid-sized, mid-western city become a hub for design, public art, environmental sustainability, urban development, craft beer, and of course, the world’s most popular annual public art event? Welcome to Grand Rapids, Michigan. Like many comparable cities, Grand Rapids was originally built on manufacturing, but unlike other Michigan cities firmly rooted in the automotive industry, Grand Rapids was known for furniture. Companies like Steelcase, Haworth and Herman Miller not only made Grand Rapids the furniture capital of the world, but also built a culture of design and aesthetic appreciation that is still strongly integrated into the region’s economic and cultural DNA. In 1967, long before public-private partnerships were the norm, Grand Rapids made history in realizing a massive public art project, the first public art installation ever funded by the National Endowment for the Arts. Two years later, Alexander Calder’s La Grande Vitesse (The Great Swiftness, or Grand Rapids) was installed in the center of downtown. The 42-ton iconic sculpture quickly became an emblem of the city, coalescing an identity derived from its namesake river with its long-standing values of art, design, civic collaboration and philanthropic support of the arts. Several other public art commissions would follow, including Mark Di Suvero’s iconic tire swing titled Motu Viget, the Latin phrase Grand Rapids used as its official motto meaning “strength in activity” -- placed in view of La Grande Vitesse. The two iconic pieces work well together in revealing Grand Rapids’ spirit of exuberance and play by collectively disrupting the foreboding architecture of modern government buildings and an expansive concrete plaza. Building on the momentum of La Grande Vitesse, Grand Rapids held its first Festival of the Arts in 1970. With a logo designed by Alexander Calder himself, the festival would become a signature event for downtown Grand Rapids building upon the City’s commitment to art and community. Seven years later, the Urban Institute for Contemporary Arts (UICA) was founded to “to create a venue for challenging new forms of artistic expression." Only four years later in 1981, the Grand Rapids Art Museum moved into the historic federal building, just prior to, and across the street from the new downtown location of Kendall College of Art and Design (KCAD). In 2001, Grand Rapids once again expressed its long standing commitment to art and design by commissioning not an architect or urban planner, but an artist to transform the central plaza in the middle of downtown into a large-scale public artwork that incorporated an ice rink and amphitheater into its design. Maya Lin’s work Ecliptic would become the new center of downtown Grand Rapids, immediately adjacent to what would become the site of the Grand Rapids Art Museum. In 2005, the Grand Rapids Art Museum (GRAM) moved into the world's first LEED Gold Certified art museum, one of the first major buildings designed by renowned Thai architect Kulapat Yantrasast who has since designed The Speed Art Museum amongst other significant works for Harvard University, The Art Institute of Chicago, Christie’s and is leading the re-design of Chicago’s Jackson Park. “20 of the greenest cities in the nation"
2005 also marked the 10 year anniversary of Frederik Meijer Gardens & Sculpture Park. Ranked in the top 100 most-visited art museums worldwide by The Art Newspaper, Frederik Meijer Gardens & Sculpture Park became internationally renowned for its large-scale presentations of masters such as Auguste Rodin, Pablo Picasso, Henry Moore, Edgar Degas, Barbara Hepworth, Louise Bourgeois, Mark di Suvero, Richard Serra, Roxy Paine, Ai Weiwei, George Segal, Claes Oldenburg, Kiki Smith, Andy Goldsworthy, Keith Haring, Anish Kapoor and Richard Hunt. In 2007, Grand Rapids saw the very first project by the art collective, SiTE:LAB. Then called “ActiveSite” the projects grew in size and scope winning multiple awards and gaining international attention. In 2011, the Urban Institute for Contemporary Arts moved into a new building at the very center of downtown. Today, GRAM, Frederik Meijer Gardens, UICA and SiTE:LAB all serve as venues during ArtPrize. The long-standing culture of design coupled with strong manufacturing across multiple industries helped create a culturally and economically vibrant Grand Rapids through periods where other cities faced attrition and decline. Fast forward to the mid-2000’s. Amidst a global economic crisis, Grand Rapids faced the same challenges as other American cities, and was once again able to rely on its historic values, and strengths in art, design, industry and philanthropy. While other cities braced for the worst, Grand Rapids was able to double down on its growth and success. 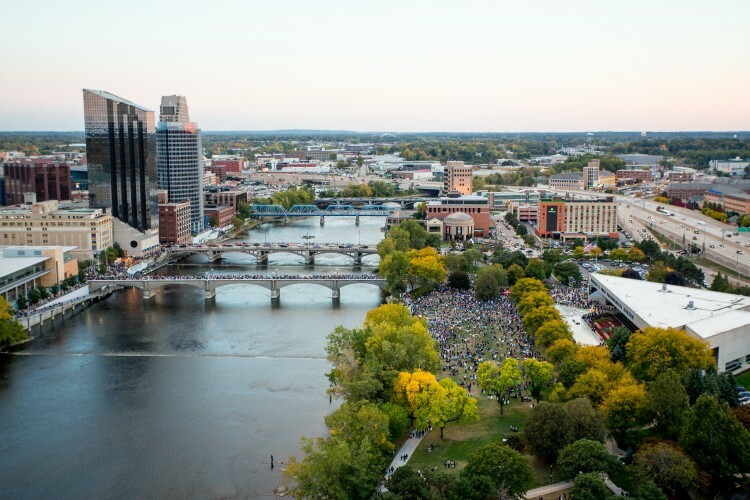 While similar cities were just beginning to envision a vibrant urban core, sustainable building and living practices, placemaking efforts, community events and cultural institutions, Grand Rapids was leading the way. Grand Rapids’ resilience over the last century lead to regional growth, and the establishing of several multi-billion dollar international corporations that foster economic growth and a philanthropic community that values art, design and civic collaboration. "100 Best Places to Live in the USA"
Grand Rapids is exactly the place for the event. It is a city rooted in a rich history of art, design and civic collaboration, and it was ready for ArtPrize. Forbes: Life sciences research, advanced manufacturing and integrated electronics. Pure Romance: 18th Sexiest City in the U.S.